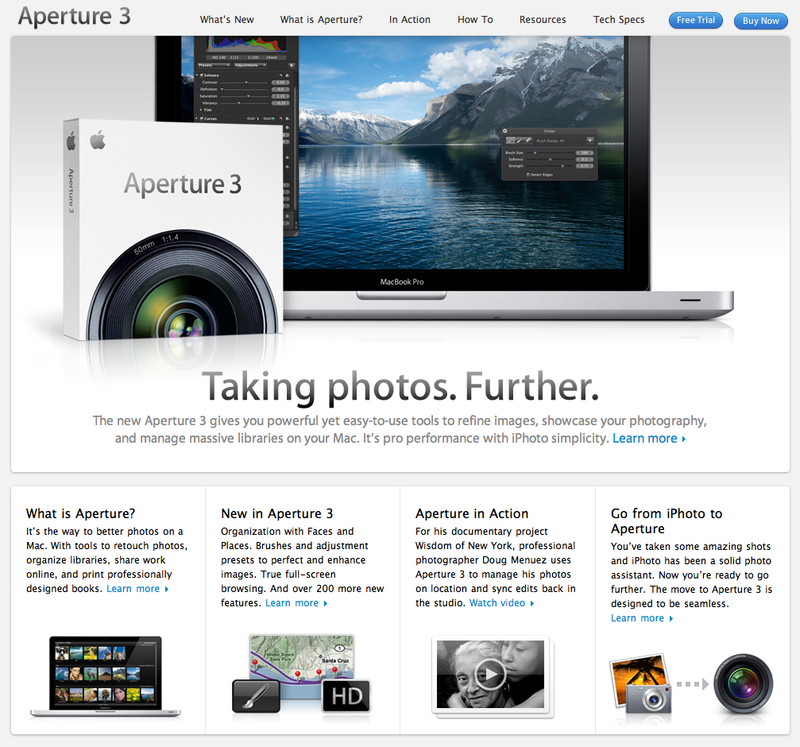 Apple released their third generation of their professional image management software, Aperture. Aperture 1 was the first of it’s kind, a real photo management system that handled large libraries of raw files and allowed it’s users unprecedented access and mobility through their image library. But really, it was little more than iPhoto with some bells and whistles. Aperture 2 came out with dozens of improvements and new features including major speeds increases, plugins and support for dozens of new raw file formats. Aperture 3 is built on Apple’s 64bit codebase so we should expect even greater speed increases as well as greater stability. It now handles video files which is very exciting to me and any photographer who is looking into transitioning into multimedia. Wedding photographers are especially subject to this shift, responsible for shooting the stills and video of a wedding with the flip of a switch on their Canon 7D or 5DMII cameras. Nikon… yeah, where are you with this? For the first time, Aperture has ever feature that iPhoto has, well, for as long as until iLife ’10 comes out. Places and Faces are finally in Aperture as well as native Facebook and Flickr integration. Non-destructive brushes and U Point style technology of editing, which made Nik Software’s Viveza a huge hit, is built right in to the application. Don’t forget the new a smoother workflow, increased organization techniques, largely due to Faces and Places integration and import actions. Adobe released Lightroom 3 beta a few months ago. I gave it a try, substituting Aperture 2 for Lightroom 3 for over a month. In the end, Aperture 2 proved to me to be a better solution for me so I can only imagine how great Aperture 3 will be. Come on Apple, send me that License! Hopefully it will come in time for me to build my presentation for PS Gallery!